Plans are taking shape for stitching family Christmas cards and managing my anxiety/depression. After experimenting with melting the wax crayons I used the best piece and freehand machine stitched the design I had in mind to use. I wanted to see if it worked with the wax melted crayon design and also if the idea looked as good on fabric as it did in my head! I’m really pleased with how it turned out. The bauble shapes need work on them as they aren’t symmetrical and also the gold edging needs to be done with a normal zig zig stitch and not by freehand as this will give a better finish. As the fabric has wax crayon on it I couldn’t use the Frixon Pens to draw the design on the fabric as using an iron to remove the pen marks would cause the crayon to melt. 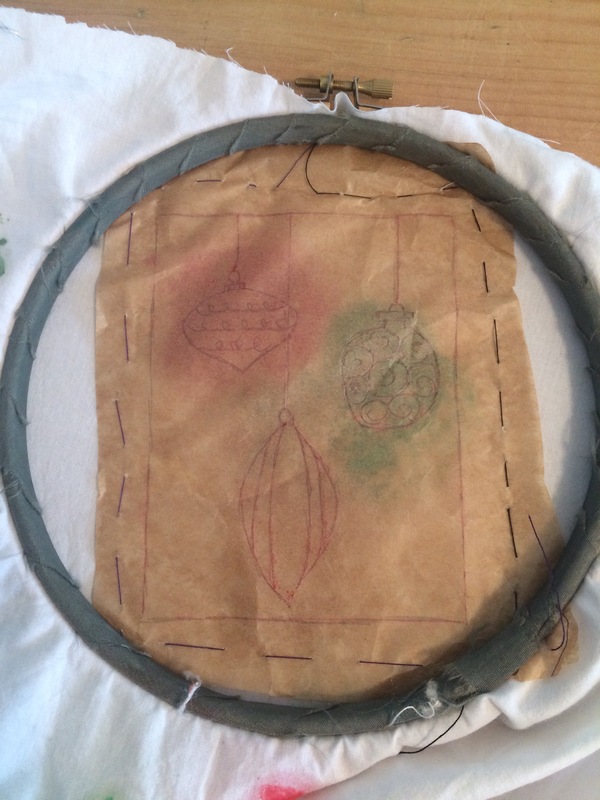 I used my trusty method of putting the design on greaseproof paper and stitching through this onto the fabric. The only problem with this is the design detail on the top two baubles is very small and it was impossible to pull all the greaseproof paper out when I had finished stitching. 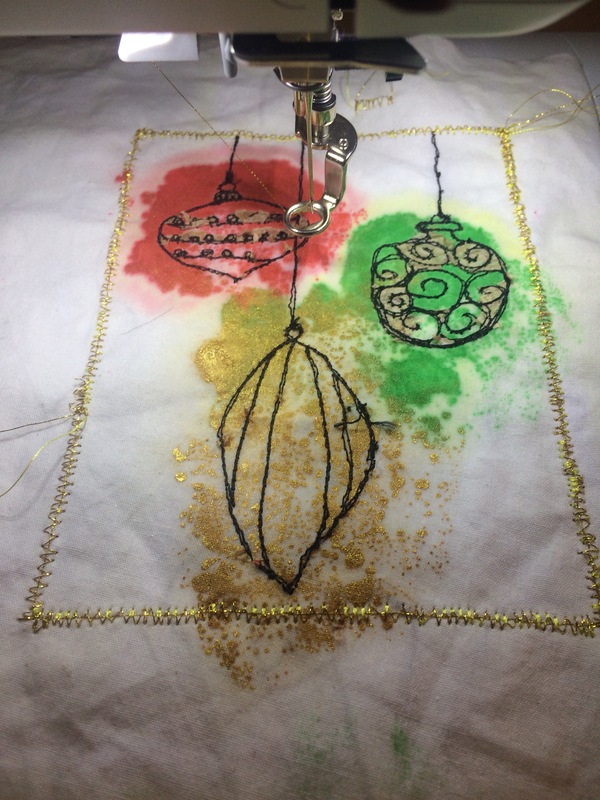 So I’m going to use the greaseproof paper to stitch the outside of the baubles and then when this is ripped off, stitch the design inside with no lines to follow. I had my last counselling session this week. They have been really helpful and led to conversations with my husband and daughter about the extra pressure/expectations I put on myself so they understand how this affects my anxiety/depression. It has shown me this pressure/expectation isn’t needed and it all comes from me. The last session proved to be very beneficial and we discussed and put together a plan of action so I can take steps earlier when my anxiety/depression starts so I don’t get to the point where it physically halts me and affects my life, family life and work. Part of the plan is to keep a record of how I’m feeling each day – my lovely planner mentioned in a previous blog is great for this and I now add a simple coloured emoji face of how I’ve felt each day. If over a 2 week period the majority of emoji faces show anxiety/depression symptoms are having an effect on how I’m feeling I will take some action. This action can include ensuring my self-care is being used to the maximum, tell my family and ask for help, let work know so they can support me, take days off work if necessary. If after a further 2 weeks the majority of emoji faces show I’m still affected by anxiety/depression I will go and see my Dr for help. The plan might not work but it’s a starting point and can be tweaked as time goes on. I’ve never had anything like this before and it’s good to have something in place as I get really frustrated and annoyed when anxiety/depression stops me and affects everything. I would love to know if anyone else has a plan like this and if it helps?